Nigeria-eligible goalkeeper Gavin Bazunu pulled on a Manchester City shirt for the first time in his career as their U18 team suffered a 2-1 loss to Stoke City in the U18 Premier League on Saturday afternoon. The Republic of Ireland youth international had a couple of training sessions with his new teammates prior to his maiden appearance as his former club Shamrock Rovers confirmed his move to England was done and dusted two days back. It was a full debut for Bazunu as he was named in Man City starting line-up along with fellow players of Nigerian descent Fisayo Dele-Bashiru and Oluwatimilehin Sobowale. The 16-year-old prevented the Potters from finding the net in a goalless first half but the deadlock was broken by Ethon Varian two minutes after the restart before James Jennings netted a second for the visitors on 58 minutes. 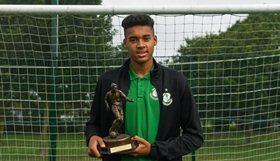 Bazunu was the star of Shamrock Rovers youth teams before he was promoted to the first team, for whom he posted four shutouts in six matches in 2018. He will compete with Louie Moulden, Lewis Thomas, James Trafford and Cieran Slicker for the goalkeeper's spot at Man City U18s.